How would you like to interact with the character's of a story as the story unfolds? 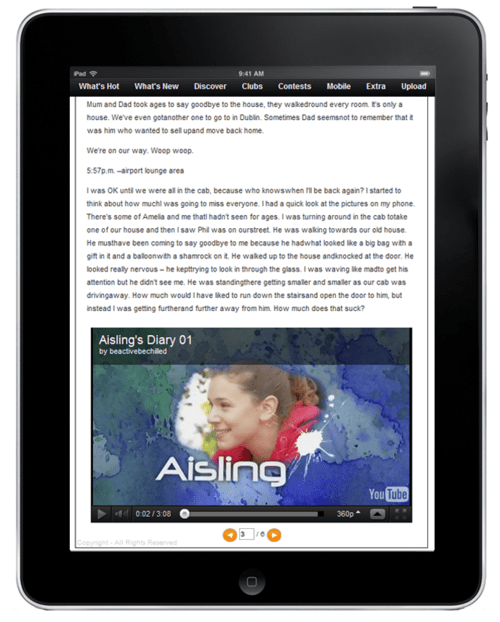 Then you might be interested in Aisling's Diary, a new experiment from WattPad and beActive Entertainment. Aisling's Diary is a crossover project created by beActive. It's both a YA novel as well as a an ongoing collection of video clips, tweets, and comments from the main character, Aisling. It's going to be posted on Wattpad one chapter at a time, and there's also going to be with each chapter featuring Aisling. The project is going to run for several months, and you can find it on both the Wattpad website as well as the iOS and Android apps. You'll also be able to interact with the character on Facebook, Twitter, and Wattpad . This particular project doesn't interest me any (I stopped reading teen fiction when I was 12), but the idea can be a lot of fun. I helped create a project like this over on MobileRead Forums back in 2009. One of the MR team had created a character called Rock Lobster who was a 1940s style private detective. Well, it would be more accurate to say that he was a satire of the genre, not a genuine attempt to recreate it. The story was told by the main character, who we had first introduced a few weeks before. We all took part in interacting with him as a real person and coming up with slightly nutty things for him to say about his job. That project only lasted a couple months but it was a lot of fun. Now, if the Aisling's Diary doesn't interest you (but you like the idea) then you might want to take a look at the vast number of fictional members of Twitter. There are any number of faux characters from both famous and unknown novels, movies, comics, etc, on Twitter. Most are intended to be humerous but some try to take it seriously. I'm not sure what character you'd want to meet so all I can recommend is that you go search for the ones you are familiar with. TBH, I'm not sure all what is over there. Every so often I find something new, myself.